Dessert tables are an awesome element to your event! It is a great way to reveal your theme while entertaining your guests with amazing sweets. 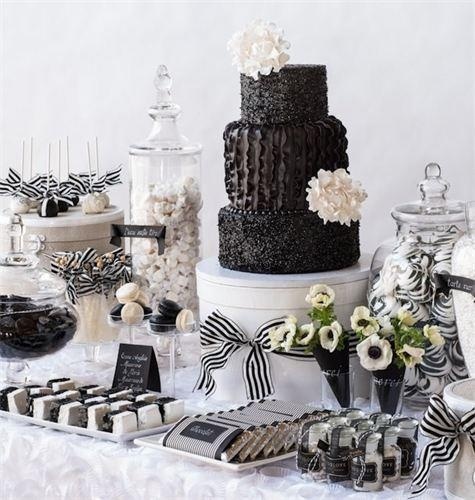 A dessert table is simple, yet the perfect "extra something" for your event. First thing you want to do is create your color scheme, once you have that down you can drape your table with great linens. A desert table is supposed to be fun so don’t be afraid to use textured linens or other types of fabric such as chiffon or satin. When organizing your desserts it is great to have different heights and shaped dishes, containers, stands, and holders. It’s best to place your taller items towards the back of the table and your flat, shorter items in the front. What desserts should you use!? There are an endless amount of sweets and goodies to choose from for your dessert table. Stay simple and stick to your favorites! Cake pops are so popular and can be designed into almost anything. From movie & cartoon characters, animals, shapes, holidays symbols, anything to go with the theme of your event! These are great displayed using a pop stand where you are able to stick the end your your cake pop into a small hole so that the pop is upright. These also come is so many designs and can easily be made yourself. 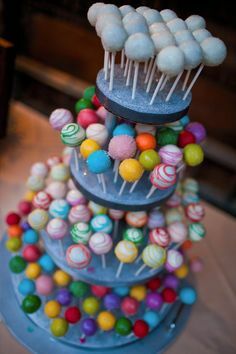 Purchase cheap styrofoam from a craft store, cover it with fabric, construct it how you would like, then simply stick your cake pops in. You can fill a cute tin container up with colored gum balls and stick the pops in or fill up a clear vase with white or colored sugar and place the pops in. These are great ways to display sugar sticks, straws, or lollipops as well. A popular way to display treats such as gum balls, chocolate covered pretzels, gummies, suckers, etc. is to fill up clear glass jars. Display your tarts, mini cakes, and cupcakes on square plates and neatly line them up. 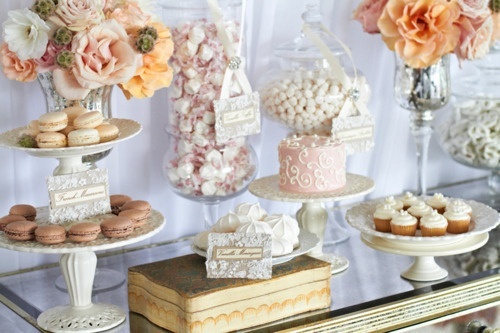 Cake stands are always elegant and great way to elevate your desserts. To keep up with your theme you can find great wooden boxes, clear upside down vases, etc. to elevate plates. Label your desserts! You can get fancy with your dessert name cards or you can easily keep it simple. It is important to label your desserts so your guests know what they are eating, especially if someone has an allergy. You can purchase blank cards at a craft store and use an awesome gold or silver pen to write your dessert names. You can even order these online and find any design that fits your theme. Don’t forget, flowers are a key element to your desert table and will really make it pop! Fill up vases to match your theme with awesome colored flowers of your choice! Candles are also really important if your event takes place in the evening. Large taper candles can look great behind all of your desserts or small tea lights scattered throughout the table. It is a great touch to have your guests be able to take the desserts home with them so be sure to have a cute cellophane baggies with twist ties or small chinese containers for your guests to fill up! 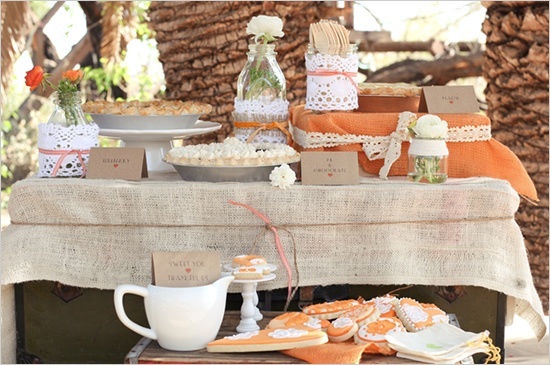 What ever you decide be sure to have fun with your dessert table because it should be playful and fun! http://www.fantasyfrostings.com - Companies like Fantasy Frostings do custom cakes, cake pops, tarts, and cupcakes and will help design your desert table.